In Take Me Out to the Dog Park, I described some features that contribute to a successful — fun, safe — dog park. But a perfectly designed and maintained park can be a nightmare if the dogs and humans who hang out there create a bad dog park culture. How can you tell? Before letting your dog off leash in an unfamiliar dog park, check it out. If you can, observe the park during busy after-work or weekend hours. If not, observe for a few minutes before letting your darling out of the car. Inattentive dog owners are a key contributor to unsafe and unpleasant dog park experiences. If the people are all clustered around the edge, chatting in small groups, or sitting on benches sipping coffee and ignoring the dogs, walk away. Some dog parks have a “let dogs be dogs” culture that encourages bullying. In Sue Sternberg’s excellent APDT Webinar, she showed video footage from a small urban dog park where dogs bullied and ganged up on other dogs while the oblivious humans sat on the sidelines. You are your dog’s advocate and protector — if your dog is being bullied, get him out of there! You are also the responsible grown-up, frightening as that may be. If your dog is being a bully, get him out of there! Not all dog play is appropriate, and dog owners need to be aware of what’s happening so they can stop unsafe play. What does dog bullying look like? If a dog keeps bugging another dog to play, even though the other dog has looked away, walked away, or barked, bared teeth, or otherwise told the first dog that he’s not interested, that dog is being a bully. If a dog pursues another dog, and nothing the other dog does can shake him, that dog is being a bully. If one dog body slams or plays roughly and the other dog is trying to get away or is not equally engaged in the roughhousing, it’s time to step in. Watch those high-speed doggy chases, too. Sometimes it is all in good fun. 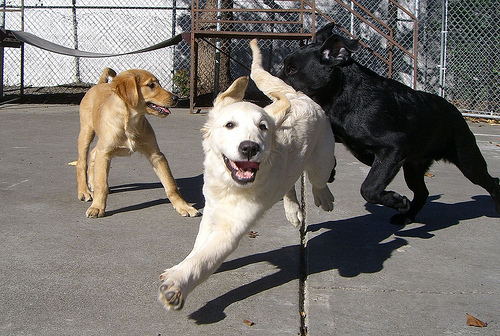 The dogs chase each other, stop and restart, and look relaxed and happy, with tails up and ears back. But if the “chasee” has his ears forward and his tail tucked and looks scared, or if several dogs are chasing one dog, the dog being chased needs help. If a chase never changes directions — the same dog is always being chased — the chaser(s) might be bullying the other dog. Entry gates at dog parks are prime spots for scary interactions. If several dogs are milling around the gate — or approach as you and your dog enter the double gate — be very careful. Walking into a mob of strange dogs is a stressful experience for your dog. The dogs might be friendly; they might also harass or attack an entering dog, especially if he seems nervous or defensive. Do your dog a favor and wait until the entryway is clear. Not all dogs automatically learn the social graces. If your dog needs to learn some manners, try to set up one-on-one play dates with well-socialized dogs who can teach him the boundaries of appropriate dog play. And if you do take him to the dog park, remove him the instant you see him picking on another dog. He will learn that the fun stops when he acts like a bully, and the other dogs and people at the park will appreciate your conscientiousness. Dog parks can be wonderful places for dogs to socialize and burn off energy. But some dogs are shy or timid; a dog park is too stressful for these dogs. And there are too many stories of dogs being injured or attacked to assume that all dog park experiences will be good ones. Think carefully about whether your dog will enjoy the rough-and-tumble of multi-dog play, and take the time to check out a dog park’s culture before you go.